1. It sounds like the name of an ABC sitcom that involves some washed-up actor or actress who chose a TV career for a change of pace instead if admitting their last five movies have made less than 25 million combined in theatre revenues. 2. It might be the title of a country song which describes the trials and tribulations of the contours challenging a John Deere tractor in the attempt to harvest a bumper crop of wheat. 3. It could describe the geography of the walk from O’Farrell to this Hyde St. eatery in the Russian Hill district. In fact, it is a relatively quaint Italian joint located between the pier and the bustling, tourist-ridden O’Farrell street. It doesn’t get the fanfare and hype of the more visible eateries but regularly sits in the top 25 of the 5000 San Francisco restaurants on tripadvisor. We booked a table for six which seemed to take up a good portion of the restaurant as we were seated in the back corner. The menu changes regularly but focuses on classic fare in a classic setting. It’s evident when you read the menu that the place pledges allegiance to locally sourced food. The vegetables, herbs and proteins come from a guy named Jim or Bob or Jim Bob and from places like Full Belly and All Star farms. The service staff was cordial but a bit confused. They had a couple of waiters taking care of our table who had different levels of understanding. For example, I was offered a unique white wine by one waiter whereas the other had no idea what I was talking about when I ordered another glass. That said, there was a definite and rightful pride in their demeanor when describing the rustic dishes. The table agreed on an array of first plates to share which ranged from $9-15. 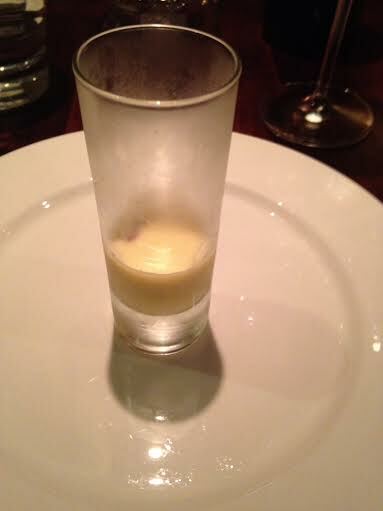 First, we were treated to an amuse bouche which was a delicious melon soup. The duck liver pate was a bit unorthodox in that it was served chunky country style instead of smooth like the surrounding eateries. That said, it was pretty decent. 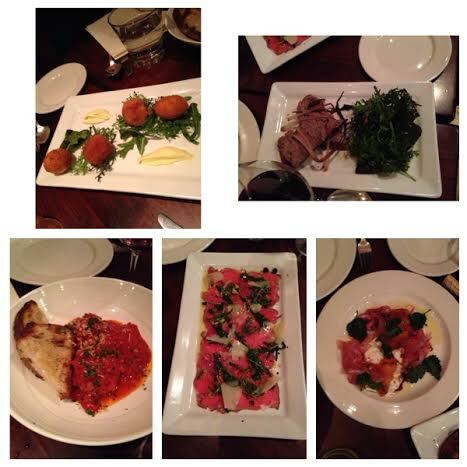 Other choices were the meatballs, arancini, burrata with tomato and prosciutto and carpaccio. In summary, none were remarkable but none were bad either. If I had to pick, the meatballs won the battle. In the meantime, as more people crammed into the small quarters, the temperature rose to the point of slight discomfort. With more of a crowd the service got a little choppier. 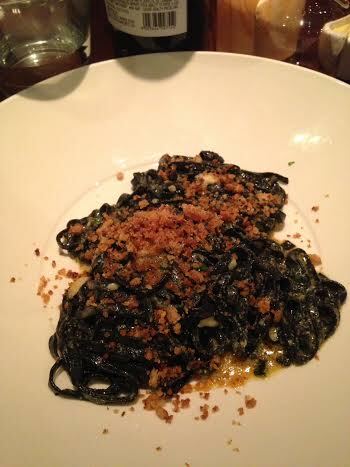 For the main I ordered the squid ink (or neri) pasta. Like the Italian cliche, it was delicious in it’s simplicity but became a little monotonous even with the addition of a generous amounts crispy breadcrumbs. I found the portion size quite ample and of good value for the price. Seven Hills is the quintessential small family run bistro within a very diverse and vibrant dining scene. It’s simple in it’s theme, decor and food. There are no major surprises and I imagine no major inconsistencies. There’s a true commitment to partnerships with local farmers which comes out in the food. If you’re looking for adventure, there’s a hundred other places. However, if you want a safe haven for traditional fare or have a table full of people who thinks Joe Bastianich should be canonized and lament the fact that Mario Batali will never open a restaurant in San Francisco, this could be your place. Sure, there are service hiccups but it lacks the phoniness of chains and smiling hostesses who seem way too excited over the fact you might have a coat to check. After dining at Seven Hills, I think it can be described as a sitcom about an all American small Italian ristorante frequented by Al Pacino and Tony Danza with cameo appearances by Ray Romano and Robert DeNiro (playing local farmers Jim and Bob) and lovable yet confused waitstaff including the likes of Joey Tribbiani.